*Chopper Reid in Cambridge... What?! 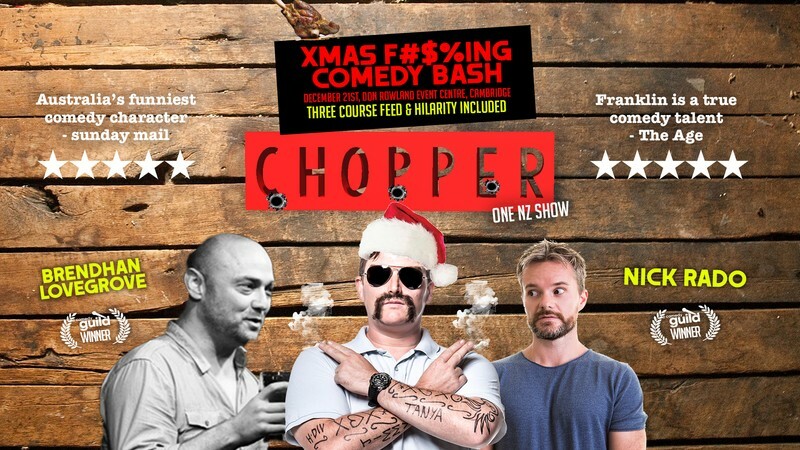 Yup you read that right, we're flying the legendary, the infamous, the downright hilarious 'Chopper' to NZ for one show only! A Logie- nominated Australian actor, comedic performer, improviser and writer. Franklin made his television debut on sketch show The Ronnie Johns Half Hour, where his character, 'Chopper’, a comedic impersonation of real-life criminal Mark 'Chopper' Read, has become an international cult hit. In 2007, Franklin performed his debut Australian national live tour, Chopper's Harden the F*ck Up Australia Tour, going on to perform an international version of the show in a sell-out season in London, then Edinburgh Fringe. Since 2007, Franklin, as ‘Chopper’, has sold over 500,000 tickets across Australia, New Zealand and the UK. Winner of the 2006,2007,2008,2009,2010,2011,2012,2014 & 2015 NZ Comedy Guild Award for Best Male Comedian. Brendhan is a favourite on the NZ Comedy Circuit and a much-loved regular headliner and host at The Classic. With an arm's length list of awards, he has entertained sold-out crowds for well over a decade within New Zealand, Australia, Asia and UK. Nick Rado is a multi-award winning, presenter, producer, writer, MC and stand-up comedian with national and international success in the radio and stand-up comedy industries.